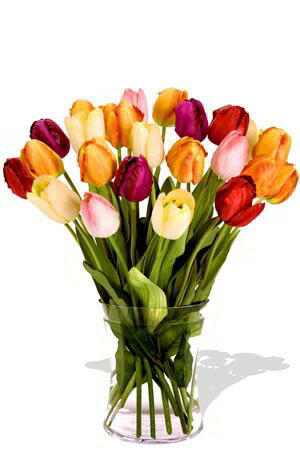 An explosion of two dozen vibrant Tulips is a necessary companion to any occasion worth celebrating! Add a vase to this bouquet to keep the celebrations lasting even longer!The vase pictured in this image is not included, however for a lasting impression we recommend you include a Superior Vase in your order. Ordered the morning and it was delivered during the day, very satisfied. Easy to order great service just one little hip cup was the size of balloon I thought I'd order the large one only got a small one on a stick, but otherwise happy with the service ! !